This high-keyed, optically thrilling painting was the first work by Aspden to be acquired by the Art Gallery of New South Wales. It reveals the artist’s genesis in the avant-garde of 1960s Sydney in which a generation of young painters – inspired by contemporary developments abroad, most significantly in the United States – turned to a highly refined and reductive formalism as a new way of thinking about and making art. In this ‘new abstraction’, concerns of subject and social or geographical context were subsumed by the purist, formal qualities of the work. 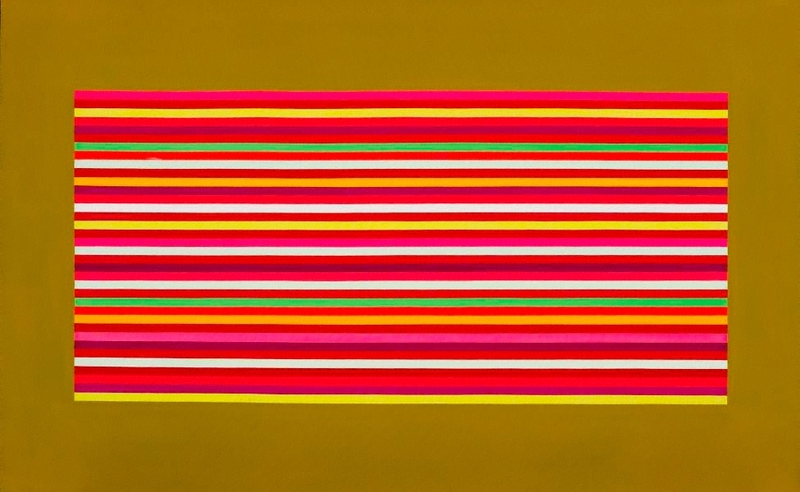 While Aspden’s early experimentation in the 1960s with shaped canvases, expanses of uniform colour and hard-edged geometic forms gave way to a freer, more painterly style in the 1970s, some elements of his early hard-edge colour-field phase remained. 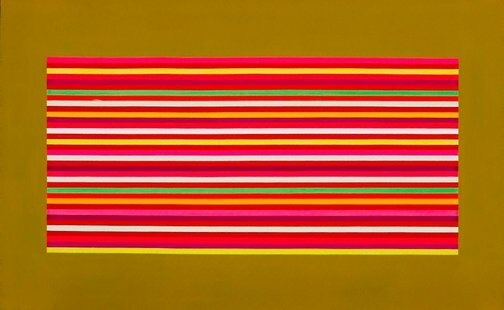 These included his habit of working on a large scale, his fascination with colour and formal relationships within an image, and his interest in the idea of art as an experience, in which the autonomous object had a direct and active relationship with the viewer. Signed and dated c. verso, black fibre-tipped pen "ASPDEN 69".